By Stephen Nye Barton MD. 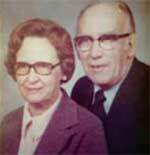 Ph.D.
“My father, A. Russell Barton, was born June 11, 1906. At the age of 18, he began what was to be 22 years of playing the viola in the Minneapolis Symphony Orchestra (it became the Minnesota Orchestra in 1968). He had a great appreciation for arts and culture, and while the orchestra traveled throughout the United States and Europe he was able to visit many of the world’s great museums and art galleries. “While in the symphony, my father also developed skills in engineering and architectural drafting. After leaving the orchestra, he joined the University of Minnesota’s Department of Agricultural Engineering on the St. Paul campus. Because of his knowledge and interest in art, he was given the responsibility of coordinating the annual Minnesota “Town and Country Art Show.” He continued to perform as a professional musician and, not surprisingly, included music as part of the Art show. He was also a poet and the some of the shows included a contest for writers. “My father chaired the organizational meeting that adopted the Constitution and Bylaws that created the Minnesota Rural Artists Association (MRAA). The meeting was held at the Library on the University of St. Paul Campus on January 14, 1959. At that meeting there was an election of Officers and the Board of Directors. Although my father was not an MRAA officer, he continued as the University consultant and advisor to the MRAA until his retirement from the University of Minnesota on May 30, 1974.